Posted on November 8, 2014 by No Map Required Posted in Costa Rica, Dessert	. This is for everyone not familiar with the fabulous, one and only spiny fruit: the rambutan! Aaron had them first in Thailand and introduced me to them…probably via the Uwajimaya store in Seattle. 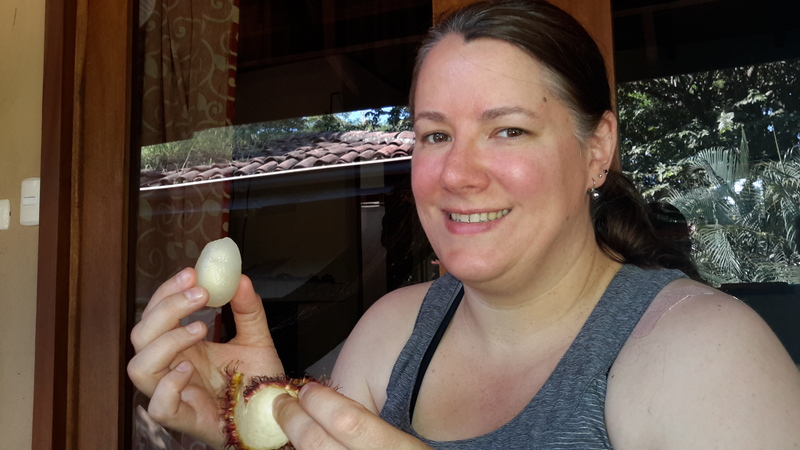 We were surprised during our 5 hour shuttle ride across the country to see rambutan fruit stands along the road. In the US, if you can find them at all, they are dried up from traveling from Asia and ridiculously expensive. Here Miguel stopped and we got a kilo (2.2lbs – about 20 rambutans, I’d say) for only $1500 colones. That’s about $3! Awesome! And oh-so-delicious. Step two: eat the rambutan. Yummy! 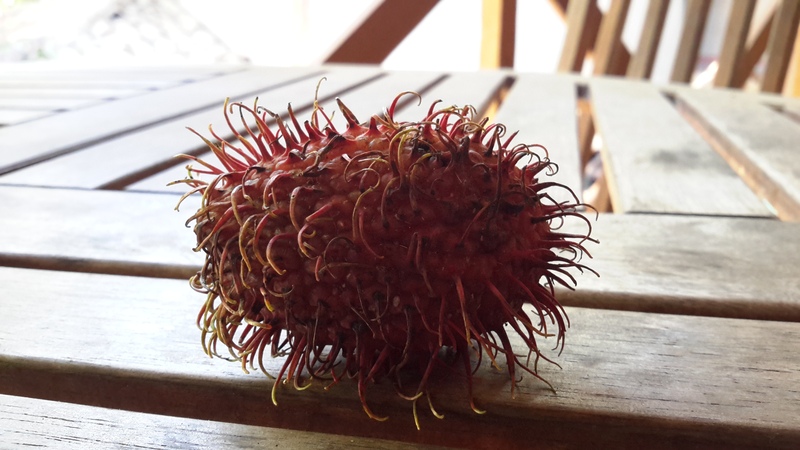 The rambutan has a weird hairy shell. You twist or bite to crack the shell (the spines are soft so they don’t stab you if you bite, thank goodness!) 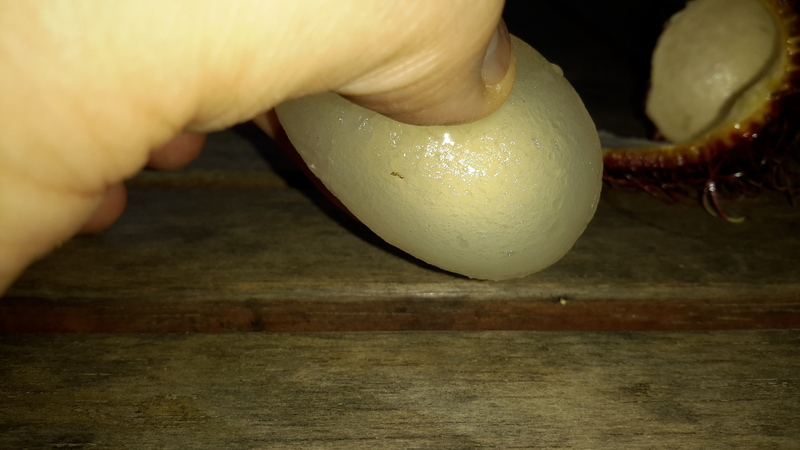 and inside is an egg-shaped seed surrounded with fruite like the inside of a grape! After popping open the hard rind, all that is left is to eat the fruit and spit out the pit. Yes, please, I’d gladly have another. No, another kilo. Thank you!!! Great posts, thanks for sharing! Rambutans and macaws in just your first few days. What a great start to your voyage. Thanks David! It IS a great way to start. It keeps getting better too… today we went on a chocolate tour (we’ll blog about it soon!). Hey guys! I am so happy you’re finally there! I wouldn’t blame if you if you decided to chuck the travel thing and just stay in Costa Rica for a few years, but it sounds like the CR govt. isn’t into that (thinking of the bus tickets). Have fun! Martin!!! We sure can understand why people move down here. We have been meeting expats along the way. As much as we love it, I am not sure our budget will allow us to stay a whole lot longer. Luckily there is a whole world out there! Hi Anner and Aaron! So glad to hear your CR adventures with chocolate and people. And how about Mount Arenal?? Have you heard it rumble? I love your openness … Keep living the dream and we’ll live through you!! Safe travels! Suanne. We were a bit shell-shocked our first few days but we are just starting to get into the groove. Arenal is so much different from Rainier… I won’t lie, I wasn’t sure what to expect. We haven’t heard it yet, but there is still time!